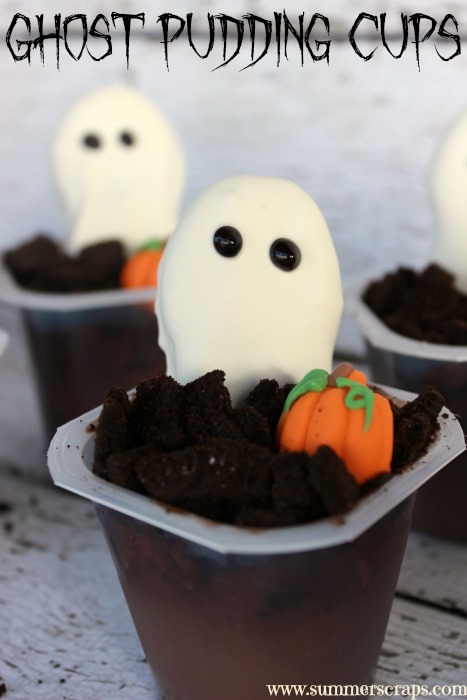 Ghost Snack Pack Pudding cups are a quick and simple treat that takes no time to make and the kids will just love it! I am a sucker for Halloween. 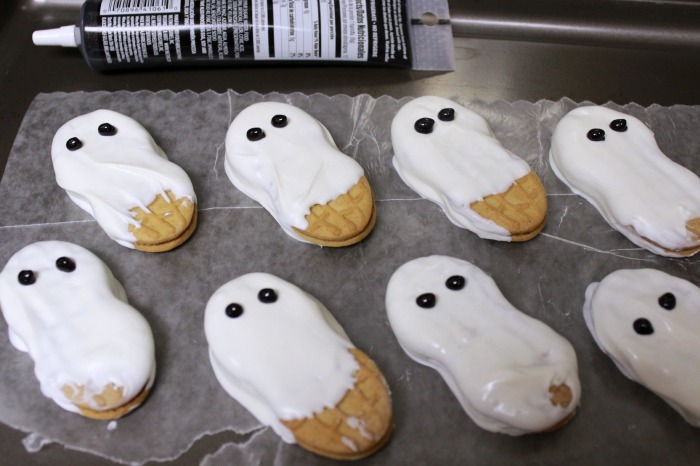 I love making weekly “spooky” treats and the kids get so excited to help me in the kitchen. 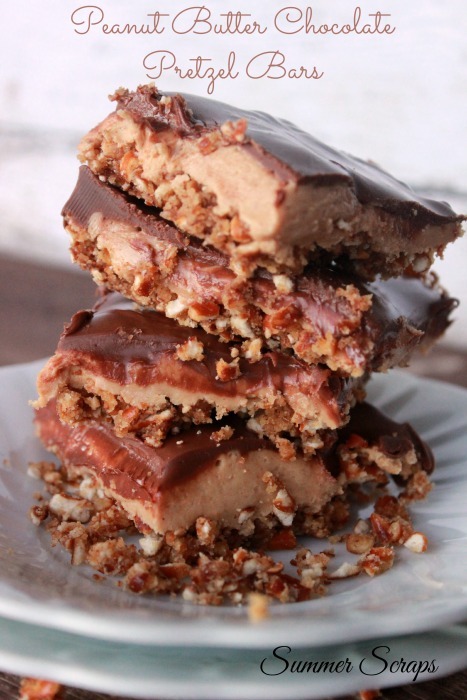 This is one of those yummy treats that the kids can easily help out with. 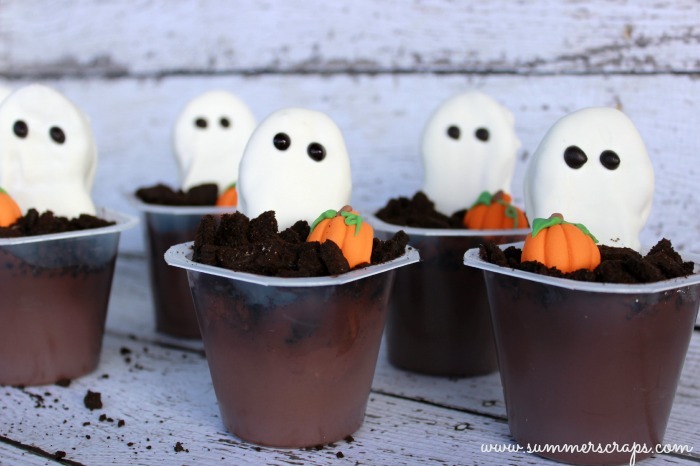 For the pudding cups I like to use the Snack Pack chocolate pudding cups. This is my kids favorite brand of pudding plus it has the same amount of calcium as an 8 oz glass of milk – can’t beat that! 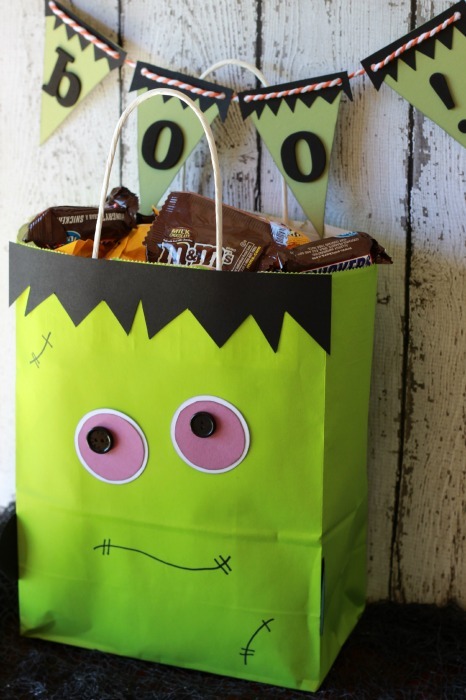 I ran to Walmart to grab my ingredients for this recipe – I love how inexpenisve the Snack Packs are! The ghosts take the longest to make (which isn’t that long at all. 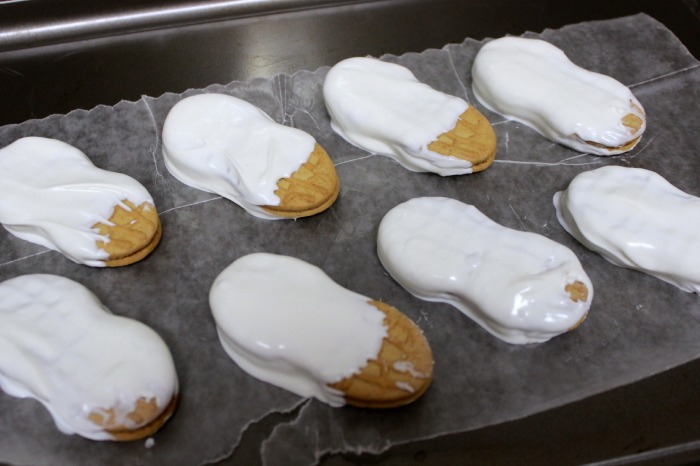 I follow the directions on the white melting chocolate or use white chocolate chips – cook in the microwave for 30 seconds, stir and repeat until melted. Once your chocolate is melted dip the Nutter Butters into the chocolate. The Nutter Butters are the perfect size and shape to make little ghosts. Let these cool on some wax paper until the chocolate is hardened (if you are in a hurry throw them in the fridge). Once they are cool use some black gel frosting to make eyes. I thougth some edible googley eyes would be fun but I could not find any. 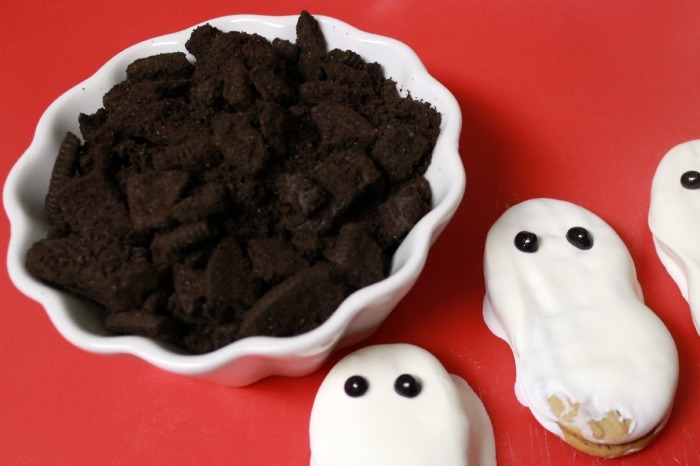 Set the ghosts aside and grab your oreos. Remove the white cream filling and crush the oreos. You can have this crushed really fine or in chunky bits. Personally I like chunky cookie bits because I like to stir it into my Snack Pack pudding. Now that everything is ready it is time to assemble. 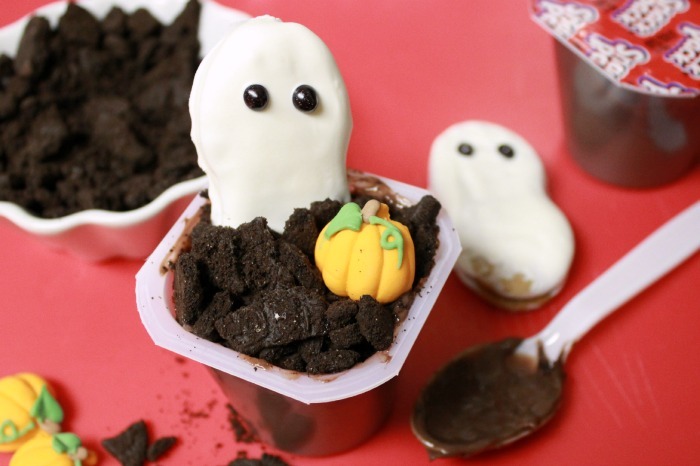 #SnackPackMixins Remove the tops from the Snack Pack pudding cups and add the crushed oreos on top to be the “dirt”. 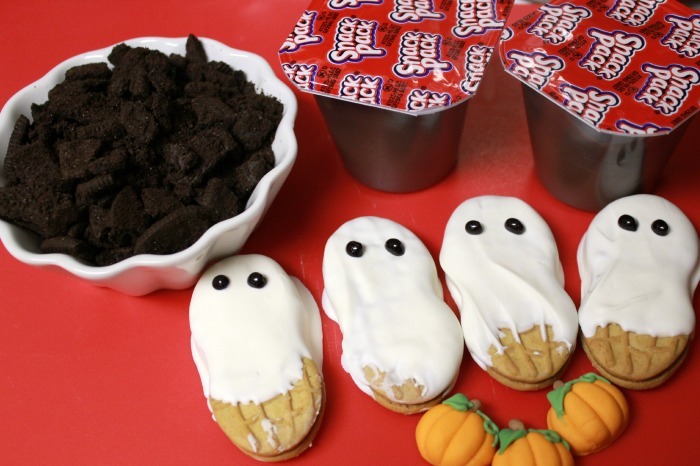 Add your ghost by gently pressing it into the “dirt” and pudding. I bought some candy pumpkins in the baking aisle that went perfect alongside my ghosts. The kids really loved these! Kayden who just loves Snack Pack Chocolate Pudding told me he just loved how everything tasted together and begged me to make it again soon. 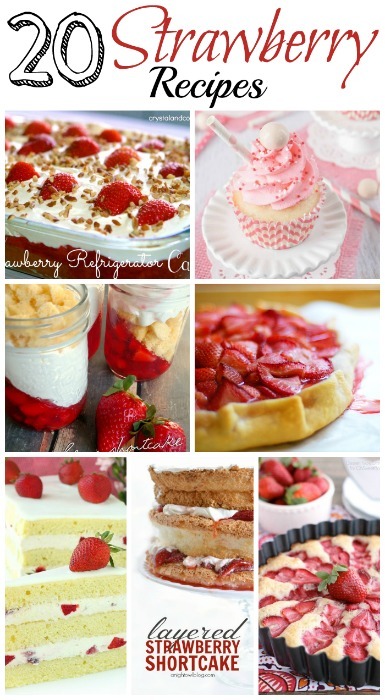 You can find more Snack Pack Pudding ideas on this pinterest board! love how cute and easy these are!! Love how cute and easy these are! Will definitely be pinning this for October! That is seriously adorable! Pinned!